When you get in an accident, many other systems are compromised in today’s sophisticated vehicles. These systems can include electrical, suspension, air-conditioning, safety harnesses, airbags, and more. 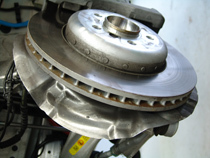 Today’s modern mechanic is no longer the “motor head” of the past. He is a highly trained automotive technician with the skills and abilities to diagnose the problem properly and put you and your family back into a safe and secure vehicle. 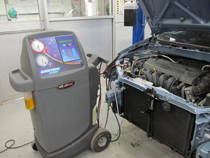 Using advanced diagnostic equipment, these technicians can pinpoint the root of the problem and repair or replace the compromised system. Our technicians must be able to work with electronic equipment that tells them what is wrong. This requires them to understand what the output from the computer means, and be familiar with and use manufacturer manuals to repair your vehicle to specifications. (Even many of these manuals are online.) At Rick’s Auto Body our ASE analysts and I-CAR certified technicians and mechanics have over 100 collective years experience diagnosing these issues. Critical parts are inspected such as belts, hoses, suspension parts, fuel and braking systems, as well as air-conditioning and cooling systems. In addition to the technical knowledge, these same technicians must use lifts, hoists, and other tools to move and/or remove parts. 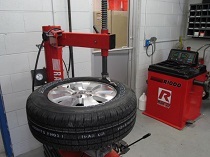 The technology aspect of auto mechanical repair is ever changing. Our I-CAR technicians are continuously upgrading their skills with on-going training courses to keep them abreast of all new technology and advanced diagnostics needed to repair your car. At Rick’s our technicians follow all S/P2 procedures and are compliant with all health, safety and environmental standards to maintain an eco-friendly working environment. We have proudly been recycling and recovering fluids, solvents, metals, tires, batteries, and other waste for 25 years. Our eco-friendly “Green” philosophy is incorporated into everything we do.